There is a drip in the bedroom!, Where? No the bladder, Dear? Noticed some wetness in the corner? Turn off the power to the waterbed heater or heaters. 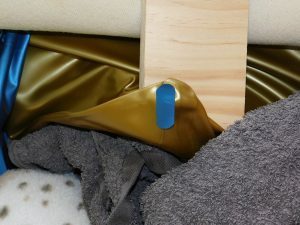 Expose the waterbed bladder by taking the bedding off and in the case of softsider waterbeds take the lambswool cover off as well. Investigate the wettest area and dry the area around the perimeter between the bladder and the liner. Make sure the liner is up and resecure it if down. Make note of the wettest area. Start investigating there for starters. Lets us assume it is down the bottom right hand corner. HAS THE VINYL OF THE BLADDER GONE HARD AND BRITTLE? IS THE VINYL OF THE BLADDER FLEXIBLE? If there is minimal water leakage then there is no need to empty the bladder. Support the corner of the bladder from the underneath and lift it above the waterline. In the process carefully MARK the breached area to and from with the point of a pen or marker. 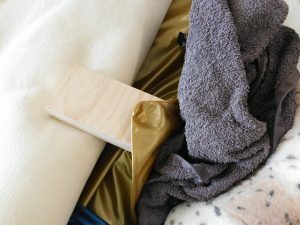 By folding the bladder and propping up with another towel or pillow. Get a smooth piece of timber under the breach. If you think there is a weakness beyond the marked area you will need to include that with a overlap in the repair. Prevention is better. 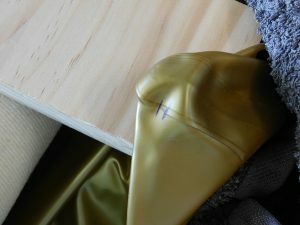 Cut the patch to the desired length and width. For this exercise I will mark the area with masking tape. Also neater and establishes outer boundaries. 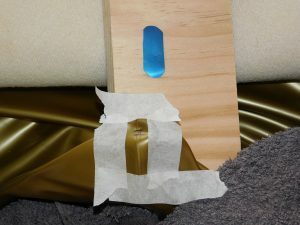 Any overlap in the gluing can be taken off when tape is removed. The area that is to be repaired and the side of the patch application surface needs to be CLEAN and DRY. 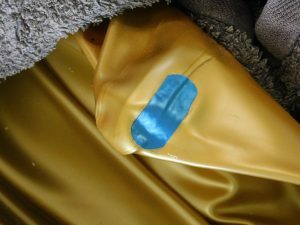 If there is moisture or suspect there is moisture, dry the repair area and side of patch to be applied. Wait and air until fumes have dispersed . Dry with hair dryer again to secure dry surface. Apply adhesive to both surfaces and spread. On this occasion a cut to reduce of end of a small brush to strengthen bristle. Be liberal with the adhesive but do not over do. If in doubt apply adhesive twice about 20 minutes apart. A little warmth from the hair dryer might be required to remove water moisture on both surfaces in higher humidity environments. Wait until the surface is tacky like sticky tape. Being careful apply the glued surface of the patch to the breached area and firmly press down. Remove masking tape if applicable. 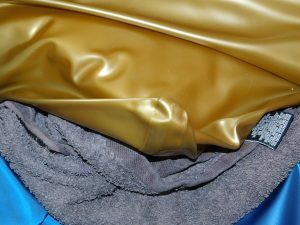 Use some non stick cushioning foam on this occasion or shopping bag plastic with something soft over the top. 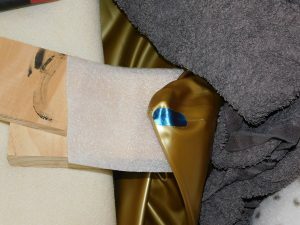 This type of PVC will not adhere to the glue after the next step. 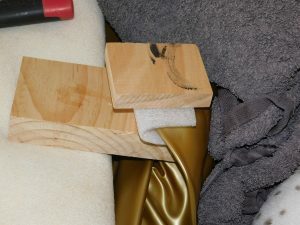 By using the bottom board as a base wrap the non stick plastic and cushioning over the just glued patch and support the outer with another piece of timber. With the adhesive glue still moist clamp firmly for 30minutes or so. Semi moist the liberally applied glue will also fill small irregular seam channels. Then release clamp and let air for an hour or two. But the longer the better, naturally. Once complete remove any excess moisture between the bladder and the liner. Remake the bed and SWEET DREAMS. Do you have or Mermaid Waterbed Concentrate Conditioner?